In June 2017, Bob Corker extended a golf-club shaped olive branch to an angry President Donald Trump. Corker, then a Tennessee Republican senator, had recently enraged Trump by saying his administration was in a “downward spiral.” Hoping to de-escalate, his aides asked the White House to broker a peacemaking meeting between the men in one of Trump’s most natural habitats: the golf course. An outing was soon arranged at Trump’s Northern Virginia course, where the pair were joined on a warm Sunday by the former star NFL quarterback Peyton Manning and Andrew Giuliani, a public liaison assistant at the White House and the son of Trump personal lawyer Rudy Giuliani. Over an 18-hole, 4½-hour round that featured a clubhouse lunch, Corker and Trump, who sported a red “Make America Great Again” hat, chatted amiably until a moment of comic relief: Andrew Giuliani chipped a ball that struck Corker in the neck. Laughing, Trump turned to Giuliani and gestured to some nearby Secret Service agents. “Thank God you didn’t do that to me — or you’d have two in the chest from these guys!” Trump joked, according to a person familiar with the incident, who said Corker escaped serious injury. Corker would soon return to feuding bitterly with Trump. But the golf outing had allowed for a brief connection in what aides and associates call Trump’s most relaxed environment. “You learn a lot about him personally,” the senator told POLITICO at the time. Trump’s golfing has been under scrutiny thanks to the recent publication of a new book that portrays him as a lifelong cheater. But much remains unknown about his golfing as president, in part because the White House has tightly shielded information about Trump’s outings and playing partners. “Sometimes he wants to be able to have a minute without [the press] being in the middle of it,” a senior White House official told POLITICO. But revealing interviews with more than 10 former and current Trump aides and golf partners suggest that golfing has become an equivalent of Trump’s infamous “executive time,” unscripted hours in which his presidency unfolds in spontaneous conversations, phone calls and occasional policy chats with athletes and celebrities. During one 2017 round with Woods, for instance, Trump asked the golf legend for his thoughts on a tax bill moving through Congress, according to a White House official. Unlike former President Barack Obama, who almost always played with a tight circle of intimate friends and aides, Trump is happy to play and talk shop with politicians like Corker and several other current and former members of Congress. But he prefers the company of celebrities, professional athletes, the occasional foreign leader and family members, including his rarely spotted youngest son, Barron, and his daughter Ivanka and sons Eric and Don Jr. 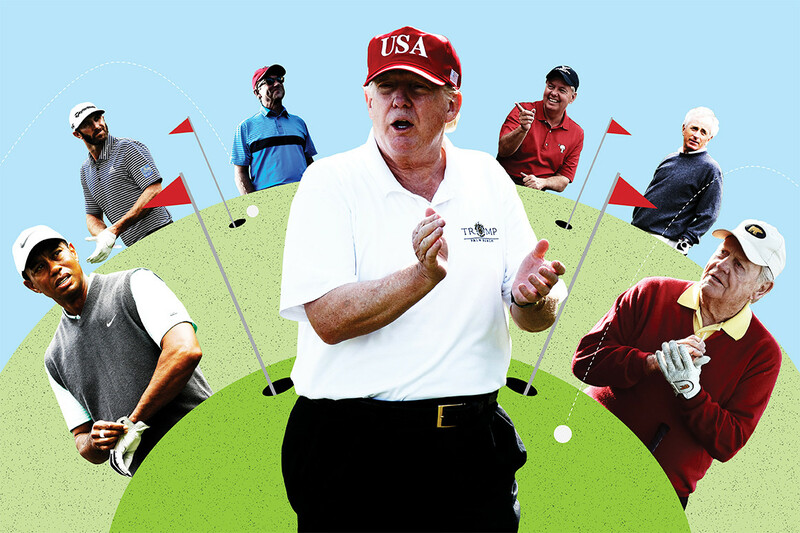 Compared with former President Bill Clinton, who rewarded big Democratic donors with time on the links, Trump has refused — much to the chagrin of some aides — to use golf as a fundraising vehicle. One source close to Trump’s campaign said he has resisted his advisers’ efforts to arrange outings with potential 2020 campaign donors. He has, however, held private events with supporters at his golf clubs, such as a dinner at his course in Rancho Palos Verdes, Calif., during a trip to the state earlier this month. A second White House official said Trump has golfed with businessmen who previously gave to his now-defunct foundation or 2016 campaign, like New York Real Estate Institute President Richard Levine, but is “working more on what bills he can get passed and what policies he can push versus raising money” out on the course. Two sources close to the president said Trump has also used his weekend golf rounds as a way to spend time with his children, including 13-year-old Barron, whose public appearances are few and far between. “I’ve seen Barron out there with him on a few occasions and he’s a good athlete by his own right,” said a Trump family friend. Trump often ridiculed Obama’s frequent weekend golfing. And as a candidate, he once told supporters he was “not going to have time” for golf if he were elected president. “It’s funny, in the world of politics, it’s hard to play a lot of golf,” he told Golf Digest three months into his presidential campaign. But since his inauguration, Trump has visited his own golf clubs 167 times, according to TrumpGolfCount, which relies on official White House pool reports, although it is unknown how many of those times he teed up. Trump has yet to play golf as president at a course he does not own, and some aides suspect he relishes showing off the pristine conditions of his properties. “I’ve been on the courses with him where he’ll stop the golf cart and say, ‘This tree just got planted,’ or ‘I’m fixing this sand trap.’ He’s very detail-oriented on the course,” a senior administration official said. When he’s finished with his golf outing, Trump sometimes meets with friends at Mar-a-Lago and shows them around his club. In 2017, Rush Limbaugh, who lives in Palm Beach, Fla., came in to meet the president and Trump was still wearing his golf spikes while he walked Limbaugh around the club, recalled a former White House official. While they were near the pool deck, Trump jumped the three steps from the top of the stairs to the bottom, “like a little kid in his golf spikes, because he was so giddy walking Rush around his club,” this person said. Sometimes Trump’s golf sessions are all about politics. His acting chief of staff, Mick Mulvaney, has used several outings with the president to cement their personal relationship. So have Republican Sens. Lindsey Graham and Rand Paul, who have pressed Trump on policy issues while on the links. Last August, Graham emerged from a day of golf with Trump to explain the president’s thinking on trade policy. And he teed off with Trump, Mulvaney and former Rep. Trey Gowdy (R-S.C.) on March 24, as the world waited for Attorney General William Barr to announce the key conclusions of special counsel Robert Mueller’s report. “Don’t forget that the president and Lindsey Graham weren’t exactly pals at the end of the campaign. Frankly, they’ve developed their relationship largely because of playing golf,” the senior White House official said. But when out with professional players like Woods or Dustin Johnson — one of many golf pros Trump knows from his pre-White House days of hosting tournaments at his courses — the conversation focuses more on the nuances of the game, even if Trump sometimes solicits the pros’ thoughts on politics and policy. Trump has golfed with five-time PGA champion Jack Nicklaus three times since taking office and with pro golfers Ernie Els, Rory McIlroy, Lexi Thompson, Woods and Johnson on multiple occasions. He only ever plays competitively with the pros, according to the senior administration official, who said the president prefers a “gross scoring” method that doesn’t subtract a player’s handicap. There’s even a Fox News component: The pro-Trump network’s prime-time host Sean Hannity has played with Trump at his West Palm Beach, Fla., course. So has Fox host Bret Baier. “Some ambassadors in Europe have begged me to tell them what they need to do to nail a golfing opportunity with President Trump, even for one hole,” an unnamed senior government official told the paper. Trump isn’t known to have played with any other foreign leaders or diplomats, apart from an unplanned August 2018 round with Australia’s ambassador to the U.S., Joe Hockey. Trump joined unexpectedly after one of his senior aides dropped out. But the day after Mueller submitted his final report to the Justice Department, Trump played with singer-songwriter Kid Rock, who shared an Instagram photo of himself in American flag pants next to a beaming Trump at one of the president’s Florida courses earlier this month. Most of the time, the staff at Trump’s courses or his acting chief of staff Mulvaney organize the outings, according to three people involved in the planning, who said the president is usually consulted three days to a week before a weekend trip to Florida or New Jersey. “He trusts his staff at the courses to put together a good game for him,” the White House official said. The White House Office of the Public Liaison also receives requests from lawmakers and business leaders wanting to play with Trump but usually passes them along to Mulvaney or the president’s personal secretary before moving forward. But sometimes, Trump just picks up the phone himself to invite partners out for a day. A person close to Johnson said the president has previously reached out to him directly to set up a round. Whoever is playing, a few things are consistent. One is that Trump does most of the talking. “He’ll tell you a story every couple of feet,” Fox’s Baier told Golf.com. Another is the regular interruptions by phone calls and official business. A White House military aide always has a secure phone for Trump’s use on the course; in addition, a personal is often stationed at the clubhouse, according to a person close to the White House. And then there’s the speed. Trump always prefers a quick pace to slow play. “If he’s out there for more than four hours, I’ve wondered what happened,” the senior administration official said. Plenty of observers have accused Trump of cheating, although scores of others insist he is one of the better amateurs they’ve played with. “I can’t tell you how many times I’ve been finishing lunch at Bedminster and someone who just finished their first time playing with him comes up and says, ‘I can’t believe he’s that good. I thought he was going to shoot 100 and he ended up shooting like 72,’” Andrew Giuliani said. Two other people who have played with him denied having ever seen him engage in deceptive tactics on the course. But now that he’s the leader of the free world, it’s also possible that Trump’s partners are happy to let him win, through foul or fair play. “The president never loses, didn’t you know?” Sen. Paul told reporters after an October 2017 round in Virginia.